Before this, Japanese scientists observed how a thought was formed, which was an entirely different process. According to the scientists, the has been a "technological tour de force:"
These insights into the molecular basis of memory were made possible by a technological tour de force never before achieved in animals: a mouse model developed at Einstein in which molecules crucial to making memories were given fluorescent "tags" so they could be observed traveling in real time in living brain cells. The process, which has been documented in two Science papers, required researchers to "stimulate neurons from the mouse's hippocampus, where memories are made and stored, and then watched fluorescently glowing beta-actin mRNA molecules form in the nuclei of neurons and travel within dendrites, the neuron's branched projections." 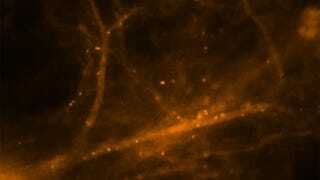 What they have found is fascinating: "mRNA in neurons is regulated through a novel process described as "masking" and "unmasking," which allows beta-actin protein to be synthesized at specific times and places and in specific amounts." This observation that neurons selectively activate protein synthesis and then shut it off fits perfectly with how we think memories are made. Frequent stimulation of the neuron would make mRNA available in frequent, controlled bursts, causing beta-actin protein to accumulate precisely where it's needed to strengthen the synapse. It kind of sounds like a computer storing data bits into a hard drive!